Weeds are often a nuisance to gardeners, who always loathe the backbreaking task to remove the unwanted, unsighted intruders from their loved gardens and lawns. One reason why the task seems to be difficult is that they usually do not have the time to research about the very plants to remove. Most of the time, they do the weeding too early or too late. For example, the vacant spot reclaimed from the removed young weed may be quickly refill by other more invasive weeds, or the weed becomes mature and bears seeds. This page here endeavours to provide some information about several common edible weeds in North America. This weed can grow huge with a deep, very long dark brownish taproot. Above the ground, it can be easily identified by its basal rosette of stout stalks of large, wavy heart-shaped leaves and a slender stem with smaller roundish leaves to the tip. The leaves are green at the top and whitish at the bottom; they can often grow to 80 cm (32 in) in length. In the first two years, the plant stays low to the ground, but it can reach a height of 1-3 m (3-10 ft) and a diameter of 1 metre (3 ft). In the summer, the stem will bear branches of flower heads (burrs) which are a long-stalked and hooked, bristly ball (2-4 cm/1-1.5 in across). In turn, each ball comprises of 2 dozens or so of very minute purple hair-like flowers which bloom between July and September. The biennial plant grows in most of the northern regions of North America and can be found along roadsides and waste grounds. The roots and the young leaves of Burdock are consumed as vegetable in the Far East and Europe, although it is considered only an edible weed in North America. The root is valued for its medicinal benefits and is also used as a traditional herb in China. As a food, the raw Burdock root is low in calories of 72 kcal for 100 g and contains 17.34 g carbohydrates, 1.53 g proteins and 0.15 g fat (Wikipedia/USDA). It also has a good amount of potassium, phosphorus, calcium, magnesium, vitamins, and amino acid. 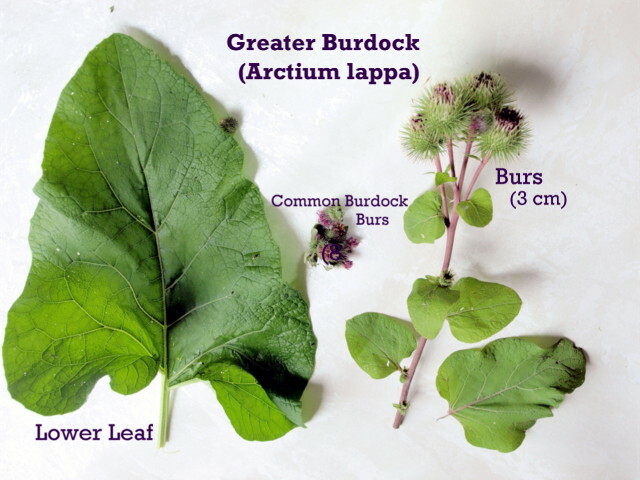 In North America, another member in Burdock is Common or Lesser Burdock (Arctium minus) is also considered an edible weed which is sometimes mistaken as a rhubarb with its slightly reddish stalks. 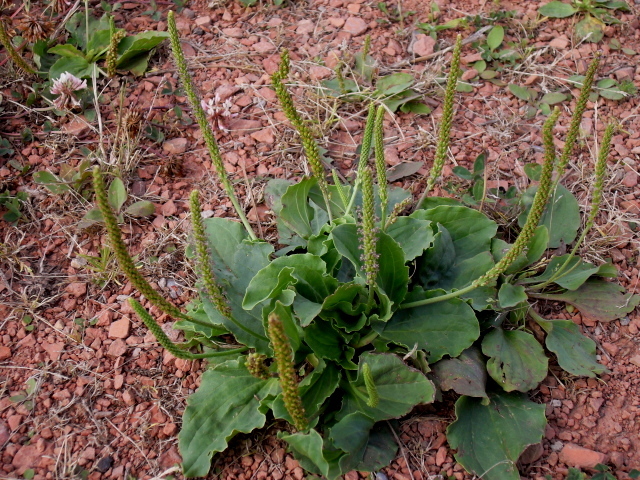 Nevertheless, it has features very similar to Greater Burdock except for its size. Common Burdock seldom exceeds 1.5 m (5 ft) tall. The sticky flower heads form a cluster of short-stalked burr balls (1-2 cm or 3/8-3/4 in. across) topped with tiny purple petals. First rinse the dirt from the roots. If desired, the skin of the root may be easily scraped or peeled by a peeler or a knife; then boil them in water for 20 minutes or until tender. Seasoning and salts may be added in the water. 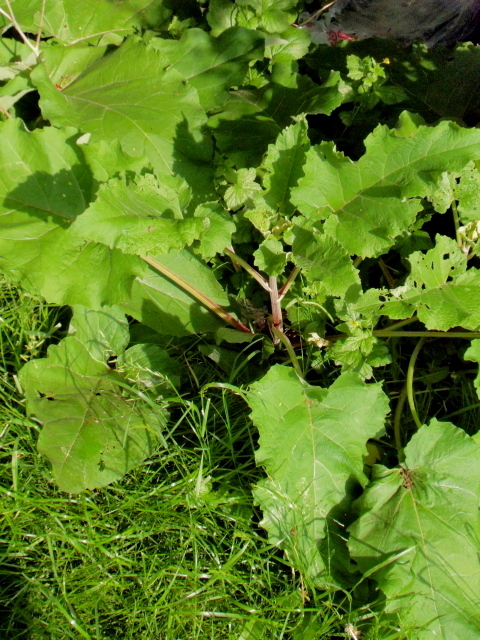 The imported, cultivated Burdock (often from China) are often a sweet taste. The roots can then be cut and eaten like carrots and parsnips as a side dish. There are many Burdock recipes in oriental cuisine. A common Chinese recipe is to place them as a key ingredient in meat soups. Daylily is a hardy, perennial wild flower that can withstand drought and harsh wintry weather. Brought from central Asia in 19th century, it thrives in the moderate climate and the spacious environment of United States and Canada. The original variety can be found in the wild from northeastern Canada to all states in eastern United States, and bloom from June to August. This rugged and adaptable plant grows fast in slightly acidic, moist soils with adequate drainage and sun light. Its habitat includes rural roadsides, park paths, stream banks and ravines . In the winter, the leaves wither and the plant become dormant with short, brownish tuber roots storing the food and water. In early spring, shoots emerge usually from a cluster of basal rosette with roots, short whitish crowns and dead leaves . 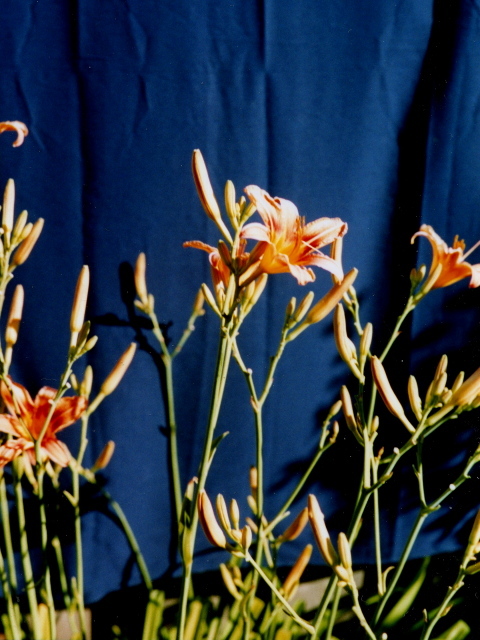 As the shoots emanate from the crowns, pairs of opposite-arranged leaves will appear. The drooping leaves are thin, long and sword-shaped with a mature length of 1-2 m (3-6 ft) long. In the blooming period, a leafless stalk emerges from the crown. Each stalk bears several branches of flower buds, which bloom one by one. 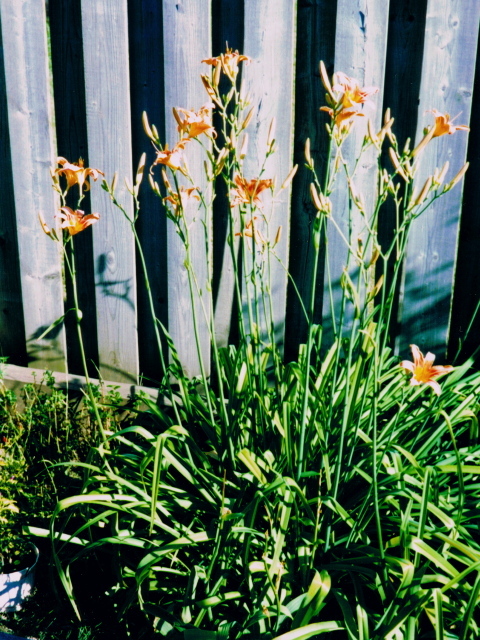 The flowers are large and of bright orange colour, however these showy flower only last one day. The flowers bloom in the morning and wither in the evening, bestowing the name to this wildflower. This plant is edible. In the Far East, the flower buds are dried and sold as a dried vegetable (Gum Jim or Golden Needle). This vegetable is often used in vegetarian dishes and soups; it has about 9.3% protein, 25% fat and 60% carbohydrate and is rich in vitamins A and C, and iron . In North America, the fresh flower buds can be eaten raw or cooked. A common recipe is to pan-fry the buds with butter. The shoots and leaves are palatable only young and tender, the older ones are fibrous and tough to digest. After rigorous washing, the small tuber roots can also be cooked. The starchy roots are said to contain a good amount of proteins. Warning - the plant could be allergic to some people and the consumption of this plant would need discretion. It is a branching shrub with a straight and red-streaked stem, characterized by diamond-shaped and broadly toothed leaves. The leaves are of dark green colour at the top and of lighter shade beneath. 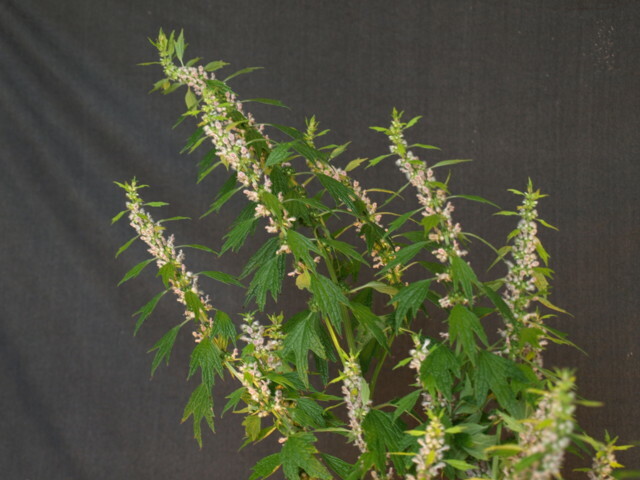 The plant seems to appear greyish because a thin coat of sliver-whitish powder on the plant, more prominent underneath the leaves and on the bracts. The minute flowers are round and of whitish green. The mature height can reach 0.3-1 m (1-3 ft). In the wild, it grows along roadsides, fields, and waste ground between June and October. This plant is cultivated and eaten in Europe and northern India. The whole plant is edible except the woody roots. From 100 g(3.5 oz), raw Lamb's-Quarters has a nutritional value - energy 180 kJ (43 kcal), carbohydrates 7.3g, dietary fibre 4 g, protein 4.2 g, and fat 0.8 g. It has 452 mg calcium, 309 mg potassium, 72 mg phosphorous, and other trace minerals it also has 80 mg Vitamin C and a source of B-complex vitamins (ref: Wikipedia). It is used in folk-medicine in the Old World; at the present, there are numerous scientific research of its medicinal claims. The preparation to cook it is quite simple. Just rinse it thoroughly. The tip of young stems with leaves can be mixed in fresh salad. For older plants, strip the leaves from the stems and cooked with other vegetables and meat. The taste of Lamb's-Quarters is similar to spinach and can be eaten likewise. The tougher stems and leaves of older plants may be used as a soup base. 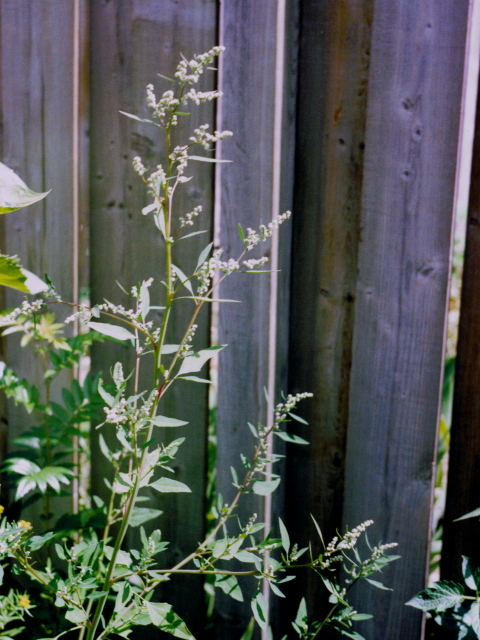 The perennial weed is a member of the Mint family (Lamiaceae) - basil, mint, oregano and sage. It can grow up to two to four feet in height. The dark green leaves with bottom colour of lighter shade change from larger size to smaller size along the green stem of square cross-section. The leaves look like maple leaves but they are narrower and have three to five lobes. It has a unusual sharp aroma and it has a bitter taste. It blooms from June to August, and the very tiny hairy pale purple flowers cluster from green pricking sepals on the upper part of the stem. A bundle of the stems with thin long tips of pinkish flowers and green leaves make the weed look quite beautiful. The pricking sepals turn to brown and dry an brown and bear tiny nuts in the winter. The weed can be found in fields, disturbed soil, roadsides and woody areas. In the old times, Europeans used this plant as as sedative tea to calm women during pregnancy. It contains alkaloid leonurine and iridoid glycosides, which relax on muscles on blood vessels, thus lowering blood pressure and heart rate. 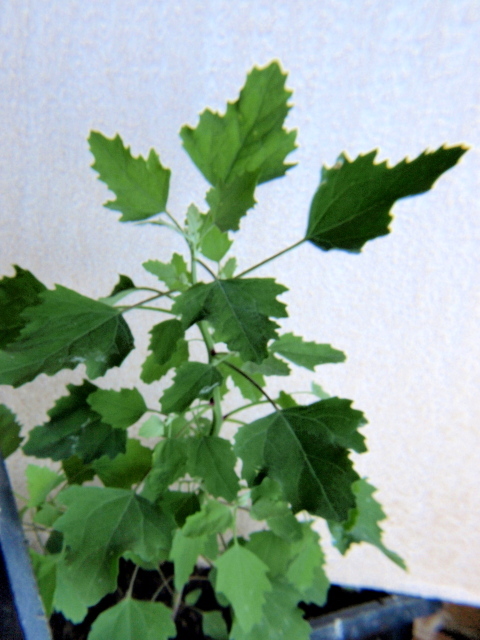 Herbalists use this plant to reduce nervousness and tension, also helping cardiovascular system. It can be used a general tonic for men and women to smooth blood vessels. 1. Boil one to two teaspoons of dried herb and leave in a cup of water (500 ml) and infuse for about 10 minutes. Drink it three times a day. 2. Add a few fresh leaves to garden salad. 3. Dry the leaves, seeds and/or stems, and powder them to use it as a spice in cooking. 4. Soak the plant in alcohol to use as a tincture for a medical drink. Higher amounts might cause stomach ache or diarrhea and skin irritations. It might interact with some blood pressure and heart medicines; it also has mild blood thinning characters that might interact aspirins and other drugs. There are commercial capsules sold by herbal companies, but the readers should consult their herbalists or medical doctors for dosage. It is a perennial low plant with a rosette of broad, oval to spade-shaped leaves. The bright green leaves are strongly ribbed with 5-9 veins, and the stalks are slightly reddish at the base. From the centre of the rosette, long-pointed sticks appear with a dense, greenish-white cluster of round tiny flowers. This flower spikes make the plant easier to spot. The leaves can reach 20 cm (8 in) in length and 9 cm (3.5 in) in width. The rosette can grow to 15-45 cm (6-18 in.) in diameter; counting the spikes, the plants can grow to 46 cm (18 in.) tall. They grow from June to October on grassy areas - lawns, meadows and pastures, and at open spaces in roadsides, gardens and waste places. 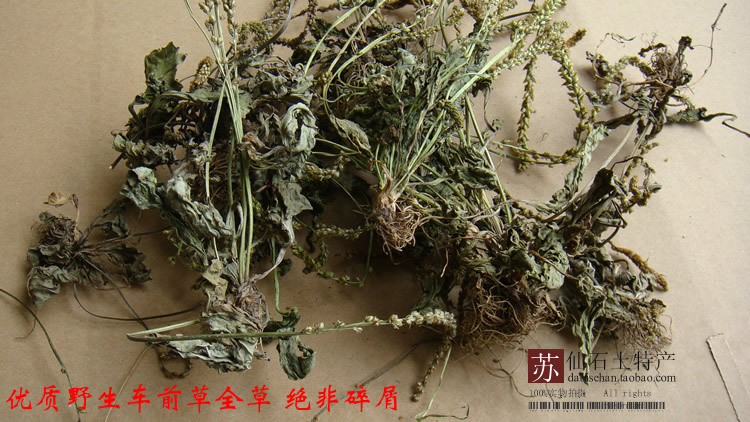 In southern China and Hong Kong, this weed has been considered an inexpensive vegetable, although this plant is not now dried as a medicine herb to aid the urinary tract for women and men. As a vegetable, 100 g of raw plantain contains 40 g protein and 1 g fat, 39 mg Vitamin C, 5.8 mg beta carotene and other minerals and vitamins. The preparation of cooking is quite straight forward - just a thorough wash in clear water. The simple recipe is by just boiling in water with a little salt. 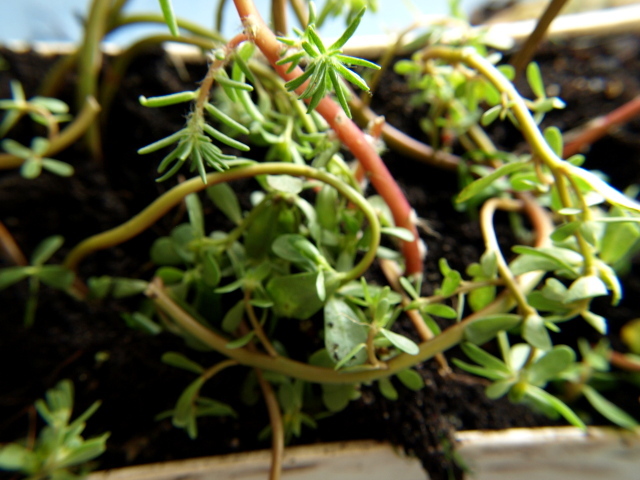 Purslane is an annual prostrate succulent weed with alternate leaves on a smooth, red stem. The fleshy green leaves are small and paddle-shaped and grow to 13 mm (1/2 in) long. Several stems propagate from a taproot and can extend to 1 m (3.3 ft) wide. The small flowers have five yellow petals and blooms from June to October. The plant thrives on loose, sandy soils with sufficient nutrients in warm climates and lower altitudes. It is resistant to droughts and can be found in disturbed soils, cultivated fields, gardens, and crevices in dry compacted areas. This edible plant originated from southern Europe and is cultivated as a leaf vegetable there. It is a weed in the United States and Canada, though it can be bought as an exotic vegetable at some farm markets in large cities. It has a crunchy texture (like bean sprouts) and a very slightly sour and slimy taste. In 100 g (3.5 oz), raw purslane has 20 kcal, 3.4 g carbohydrates, 2.0 g protein and 0.4 g fat. It has more Omega-3 fatty acids than any other plant. It has Vitamins A, B, C and E; six times more Vitamin E than spinach and seven times beta-carotene than carrots. It also has many minerals - potassium, magnesium, calcium, potassium, Phosphorus, iron, manganese and zinc (Wikipedia/USDA). Preparation: Thorough rinsing in water; cut the stems & leaves from the taproot, and use or store them in a refrigerator. 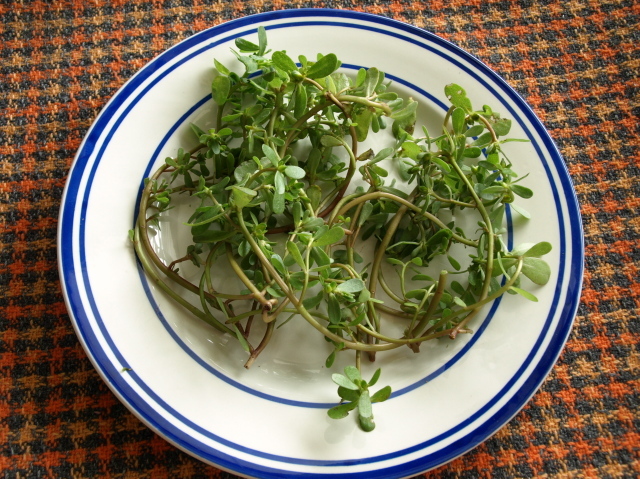 Purslane can be eaten raw or cooked, and it is a versatile ingredient in many recipes. It can be mixed in salad, dressings, stews, soups and fried dishes.